The EOHF is sponsoring a tour of the famous Romanian Chamber Choir "Madrigal" from Romania to perform a Concert of Classical Music and Christmas carols in California during the month of December 2009. On Christmas Day, Friday December 25, 2009 the choir will perform a Christmas Caroling concert at the community center. Contact our office for details. Between Novermber 2006-September 2009, the EOHF sponsored Coach Emeritus Mihai Daniel Orita to teach fencing at for all interested people, young and old in Sounthern California.the community center at 3315 Verdugo Rd., Los Angeles, CA 90065. Since October 2009 Mr. Orita is employed by Los Angeles International Fencing Center, as a Sable Coach. In June 2009, Painter Nicolai Constantin had an exhibit organized in New York with his artwork, proven to be very successful. On Sunday 26th of July 2009, together with the young painter Andreea Bagiu, Painter N. Constantin had a very successful painting exhibit (details below). 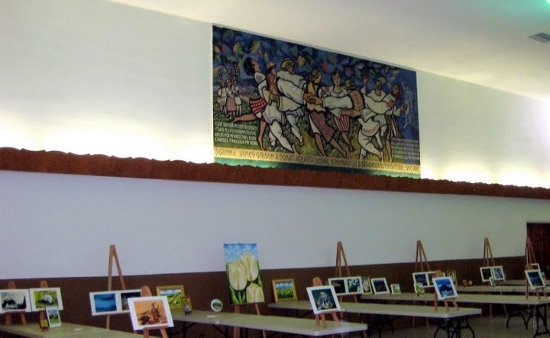 During December 16 thru 31, 2009, the Andreea's Fine art Gallery will offer, at the community center, art-pieces of traditional, still life and religious arts. For schedule and other details , contact our office. On Sunday 26th of July 2009, together with the young painter Andreea Bagiu, Painter N. Constantin had a very successful painting exhibit organized by Eastern Orthodox Heritage Foundation, in the cultural center of Holy Trinity Parish in Los Angeles, California, with a series of his famous pastels.